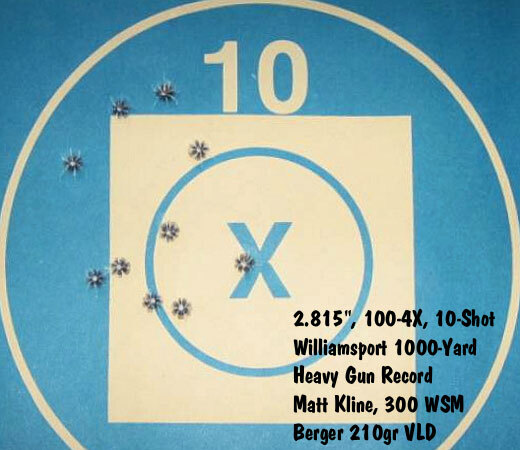 September 12th at the Original Pennsylvania 1000 Yard Benchrest Club (Williamsport) range Matt Kline set a new 10-shot Heavy Gun World Record with a 2.815″, 100-4X. Breaking the 3″ mark (for 10 shots) is big news in the 1K benchrest game. 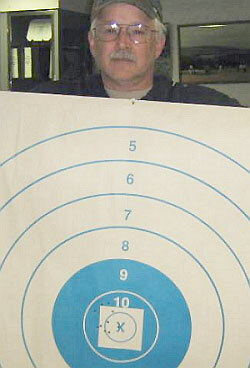 The existing IBS 10-shot, 1000-yard record is 3.044″ set by Joel Pendergraft in 2009, while the NBRSA 10-Shot, 1000-yard record is 4.322″ set by Dave Tooley in 2006. Counting this 100-4X target, Matt also set a new 6-Match Heavy Gun Score Aggregate of 99.000. With Williamsport Match 10 still to shoot, Matt could push the HG Score Agg even higher. Matt Kline shot a 300 WSM with 210gr Berger VLD bullets. This confirms the accuracy of the short magnum, which may prove to be the new “go-to” cartridge of choice for those who want to shoot the high-BC, heavy 30-caliber bullets. Matt’s gun featured a BAT action, 30″ Broughton barrel, and a Nightforce 8-32x56mm BR scope. The rifle was smithed by Mark King Rifles. Matt shared some details of his reloading process with Assist. Editor Jason Baney. This may surprise you. Matt anneals his 300 WSM brass after every firing. The necks are turned to .0135″ wall thickness for a .338″-neck chamber. Interestingly, Matt does not meplat-trim or point his Berger bullets. However, he pre-sorts the bullets very thoroughly, segregating them by .001″ variance in both bearing surface and overall bullet length. You need extremely consistent bullet-to-bullet BCs to shoot record groups like Matt did. Share the post "Matt Kline Shoots 2.815″ Record at 1000 Yards with 300 WSM"
Having shot a 2.067 inch Light Gun group in competition recently my hat goes off to Matt. These things do not happy every day and congratulations are due on a stellar performance. Just a reminder that Matt Kline’s group was 10 shots in Heavy Gun. Some organizations (NBRSA, IBS) only shoot 5 shot groups in Light Gun. There is a big difference-their records are usually smaller in Light Gun. How fast were the 210s traveling? The 210’s were going about 2850. Wow, this is an amazing achievement, Matt! Congratulations! The report already lists a lot of interesting stuff about how you achieve this phenomenal consistency, but I wonder if I could ask what powder you used? I don’t suppose you would be willing to part with the rest of your recipe? I’m proud of you Dad for yet another achievement!!! Looks like you will have to make more room for plaques and trophies. Time to add another room to the house maybe? H4350? Can’t be. That stuff has been around since the cave man! Congratulations Mr.Kline, I can remember try this a very long time ago. My comment to the H4350, when 1 said can’t be, it’s been around too old. You know sometimes the old is the good. What an accomplishment, I see your daughter is very proud, and so she should be, Dad is a master.